The Domaine La Bastide Blanche is emblematic of the Bandol appellation: nestled at the foot of one of the most beautiful villages in Provence; The Castellet, it unfolds its vineyards on hills sheltering typical Mediterranean essences. Protected from the strong heat by the sea winds and diseases by the mistral, the vine enjoys a favorable climate and one of the strongest sunshine of the South. La Bastide Blanche has been a family estate since 1972. Vignerons from generation to generation, the Bronzo have constantly translated into their wines the expression of their terroir. The 28 hectares of vines are cultivated manually and all the wines of Domaine La Bastide Blanche are certified organic. The wines produced at La Bastide Blanche are tasted throughout the world. Their elegant power has made their fame. The entire vineyard, cultivated on hillsides, benefits from the Appellation d'Origine Contrôlée Bandol. The vine-growers of the domain have developed their plots in terraces, on a southeast exposure. The terroir consists of stony soils and gravels, predominantly clay-limestone. Faithful to the requirements of the Bandol appellation, La Bastide Blanche gives Mourvèdre its prime position in its vineyards. The other varieties grown on its land are typical of Provence: Grenache, Cinsault complete the red and rosé grape variety, Ugni blanc, Bourboulenc and Sauvignon constitute the white vines. 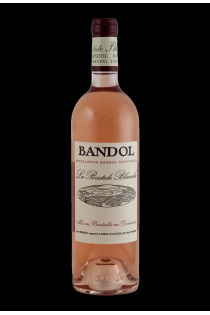 The wines of Bandol elaborated at Domaine La Bastide Blanche are good ambassadors of the appellation: muscular reds and lively, structured roses and powerful, opulent white and harmonious. The terroir of Bandol expresses itself in all its diversity in the wines of the domain, thanks to the commitment of the Bronzo family for an agriculture respectful of the environment. Domaine La Bastide Blanche has been certified organic farming since 2012 on all of its wines and is now turning to biodynamics. So that its unique terroir is sublimated in each vintage, the field does not use any fertilizer or chemical weed and prefers the mechanical work of the vine.